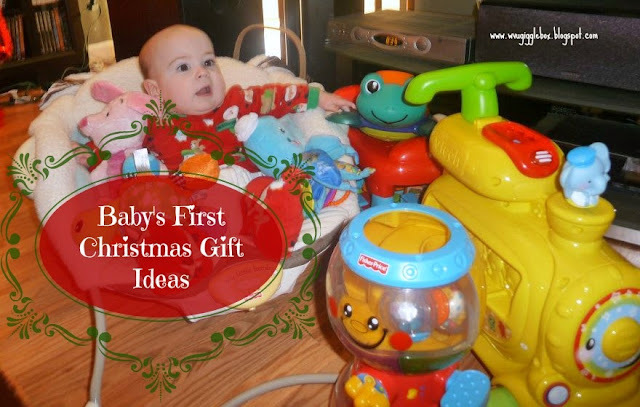 The below list is a good majority of the toys that Michael received for his first Christmas back in 2011. He was 6 months old which made it a little easier to shop for. Just within the last three years, there's even more toys out there for any baby between newborn and a year old. Fisher-Price Lil' Zoomers Spinnin' Sounds Speedway. My mother-in-law bought this for Michael as well as one of his cousins for their first Christmas. Michael absolutely loved it. The age recommendation for this is 6 months to 3 years. Fisher-Price Lil' Zoomers Rescue Racers. If you're going to get the track, might as well get a few extra cars to go with it. By the time we packed up this toy, I think Michael had about eight different cars to go with his race track. Fisher-Price Lil' Zoomers Shake & Crawl Racer. Michael at first hated this, but learned to love it. The little rattle controls the car to move forward. Age recommendation is also 6 months to 3 years. Fisher-Price Roll-a-Rounds Swirlin Surprise Gumballs. This was a gift from Santa. Age recommendation is 6 months and up. You can also purchase additional "gumballs". VTech Turn and Learn Driver. My mom purchased this for Michael and I think if he had his way, he'd still be playing with it. He has since been upgraded to a more age appropriate one, but he absolutely loved this. Age recommendation is 6 months to 3 years. VTech Sit-to-Stand Alphabet Train. Santa got this and didn't pay attention to the age range because all "he" could see was the awesome deal that "he" was getting! The recommended age range is 1 to 3 years old. Michael was having a blast on Christmas morning sitting on the train and being pushed by Uncle Chuck and listening to the music being played. We later used this as a fun way to learn his letters and some colors (ABC Fun). LeapFrog My Pal Scout. We bought this for both Michael and our nephew who's 6 weeks younger. We absolutely loved Scout. You can connect him up to your computer and personalize him. Great for trips because he can be set on a timer and play music to help get your little one to sleep. The age recommendation for him is 6 month to 3 years. If you have a little girl, you can purchase LeapFrog My Pal Violet. She does all the same things as Scout. Baby Einstein Baby Neptune Ocean Orchestra Musical. Another gift from Santa. Does not give an age range. Michael loved it and so did we. It plays classical music and lights up when the instrument that is being played. Baby Einstein Take Along Tunes Musical Toy. Another gift from my mother-in-law. Great stroller toy to keep them occupied while you're shopping. We referred to it as Michael's iPod! Little Tikes Discover Sounds WorkshopMy mother-in-law actually bought Michael a Little Tikes Discover Sounds Hammer, it looks like it's not being made anymore. He absolutely loved it. It makes noise when you "hammer" something in. This actually looks like more fun than just a hammer that makes noises. Melissa and Doug Fish Bowl Jumbo Knob - 3 PiecesMy dad and step-mom got this for Michael and he absolutely loved it. The big knobs are great for little ones hands. Don't forget about the clothes! I know, clothes aren't any fun for the child, but it's a blessing for us mommies. I love when someone buys Michael clothes, less that I need to get him. I also always say to buy clothes that are currently a little big for Michael right now, but he will grow into and possibly get two seasons out of. There's so much out there, that there shouldn't be a problem with getting something for that under 1 year old for their first Christmas. Don't forget to take plenty of pictures and video and just enjoy your very first Christmas with the best gift you could ever get!